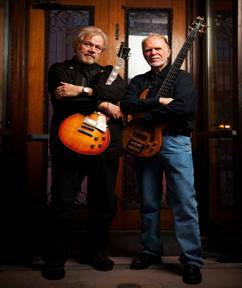 After many years of gentle prodding by music fans and industry aficionados, Randy Bachman and Fred Turner, two giants of rock n’ roll, are finally back together as Bachman & Turner after being apart for over 20 years. The group is giving away the first track “Rock n’ Roll is the Only Way Out” on their website www.bachmanandturner.com - a glimpse into Bachman & Turner’s brand new album slated for release September 7, 2010 through E1 Music. The yet-unnamed studio album, will be stocked with great new tracks - all penned by Randy Bachman and Fred Turner - that seamlessly fit among their classic rock anthems. When Fred Turner and he went their separate ways in 1977, Randy Bachman would not be stopped; he continued to pursue his unwavering love for music as a solo artist and part of the much-celebrated Guess Who reunion, then Bachman-Cummings, as well as establishing himself as a jazz artist and host of CBC/Sirius radio show, “Vinyl Tap.” Fred Turner, on the other hand, carried on with the other members of Bachman-Turner Overdrive, before actually retiring from music at the end of the ‘90s to indulge his passion for cars. Finally, the duo will hit the road together, performing their vast catalogue of hits and previewing a selection of the new songs from the upcoming album, which after everything was all Fred Turner needed to come out of retirement. “If I had a chance to go out and play new things and grow, then I’ll be offering people something,” explains Fred Turner. It’s all about the music, the creative process, collaboration and teamwork of two old friends and partners. Reunited, Randy Bachman and Fred Turner are offering their legion of fans something new and taking care of some ‘unfinished’ business as well. Bachman & Turner are backed by Brent Howard, Marc LaFrance and Mick Dalla-Vee; this sovereign trio has been performing together for over 20 years. Bachman & Turner will be kicking off their world debut in June 2010 at the Sweden Rock Festival alongside some of their contemporaries including Aerosmith, Guns n’ Roses and Billy Idol. This page reports about performing arts, musical entertainment, symphony, opera, operetta, orchestra, choirs, choral performances.